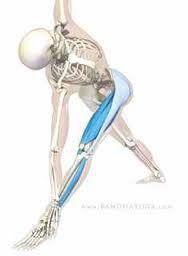 We have now explored many of the key anatomical points from the foot to the pelvis and how they relate to yoga asana. We began balancing how we distribute the weight through our feet noticing how our choices, or habits, translate further up the body. Today I will begin to highlight certain key relationships of the foot to the pelvis. These connections come from the Body-Mind Centering work. First, the sole of the foot is related to the iliac fossa, or inside bowl of the pelvis; and the top of the foot is related to the back surface of the pelvis. The big toe relates to the pubic bone. The second toe relates to the sitting bone. The middle toe connects us to the hip socket, he fourth toe to the ischial spine and greater sciatic notch, while the little toe relates to the sacroiliac joint, the PSIS, and the posterior iliac spine. A great place to feel many of these connections is in bridge. Come into bridge with all of your weight on the outside of your foot. Notice how there is little support for the front of your pelvis and all of the strain goes into the back of your pelvis. Now do bridge again with all of the weight on the inside of your foot. What do you notice? Do bridge with the weight equally distributed through the foot and notice how this balances the inside and outside of your ankles, knees, hips and thighs, as well as the front and back of your pelvis. Continue to explore these connections in all of your poses. When looking at the pelvis and the pelvic floor, we began to see the significance of relating each side of the pelvis to its respective foot. The dome of the foot, the plantar fascia, is related to the pelvic floor on that side of the pelvis. When ever one leg moves forward that side of the pelvis anteriorly rotates at the pubic disc to accommodate the movement. If the foot externally rotates, that pelvic half flares outward. Keep exploring the connection of each foot to its respective pelvic half. Also keep in mind that within each of the limbs, there are many spirals. But for now focus on the relationships of periphery to core.